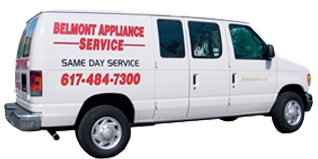 Since 1994, locally owned Belmont Appliance Service has been providing appliance repair to customers in Belmont Massachusetts and the surrounding areas. We have over 25 years of experience servicing most major brands. Since we have over 5000 parts in stock, more than 95% of our jobs are completed the same day ! Call us for reliable same day service !